I tried to join with 15m Special activities held on Nov.5 2008. Reported (8): ZL2TLD, 7L4IOU, JK1KTY, F6IRF, HB9TJM, SP3LYZ, T61AA, JA1MRE. Somebody asked abt my antenna. It is made of twin-wire type material used here by telephone companies. It uses linear stub to decouple rest of wire for 30m operation. The same stub is acting as loading element for 80m so decreasing the overall length of antenna. The following may give ideas to the WSPR'ers interested by 80m. I built a RX loop - quick dirty job with plumber / electrical PVC - let say 2 hours work. - The main loop is a single turn, made from 5mm diameter coax (only the shield is used). It is "diamond shape" 1m by side. It is tuned by a 358pF silver mica capacitor + a 5-60pF ceramic trimmer. - The coupling loop is also "diamond shape" ; 25 cm by side inside the main loop. 80m distance record. 31/10 has been a great day ! A special mention for Rich N2JR, who has the only 2xways and with 1 W !!! Now we are looking for 80m long path !!! Read more about 80m distance record. 31/10 has been a great day ! Anybody is able to calculate the speed of the object ? However this was a bad day for me, at least on RX side, due to non-stop heavy rainfalls. For those who may be interested to compair actual reports to predictions, attached is a noise map, done on 20m with rain. I have 2 clear noise sources which correspond to the power lines towers at 270 and 130 degrees. Of course the noise level is a bit lower on 17m (about 3dB according to the CCIR model). See the attached showing W1CDO signal as received here in EU. 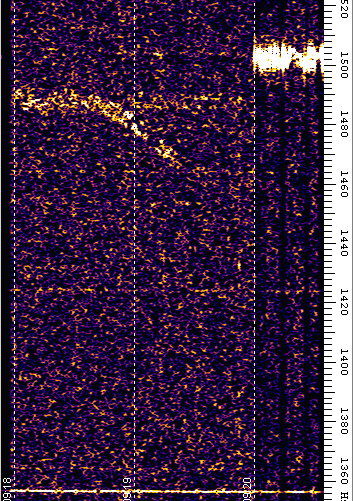 The path from NM to SE France, passes near the "aurora oval" and the effects of the frequency spreading (aurora effect) are clearly visible, although it is not strong enough to affect decoding, as it was the case on K7EK 40m signal. This explains why it is so hard for EU -stations to get WSPR spots from US west-coast stations. By the way this screen shot was taken today with quiet geomagnetic conditions (k=1 A=1). I guess that W1CDO signal will become unreadable, with perturbed conditions. Can't get password as HA6NN! Once upon a time (long ago) I registered with my callsign HA6NN and was promised to get a password in email but I have never got it! Would you be so kind to erase my first registration or send me a password for it as were promised. Read more about Can't get password as HA6NN! We have been managing to sustain a good amount of activity on 17m the last few days. I would like to propose establishing a permanent "settlement" of stations on that band. You may have noticed that I'm finally starting to devote a little time to fixing and enhancing some things on the wsprnet.org web site. I overhauled the map page to use google maps and a day/night overlay, which adds insight as we look at propagation paths. I also added a simple page called "Activity", accessible from the primary link menu across the top, which summarizes how many stations are active on each band in the last hour. That's just a shortcut to finding out where current activity is clustered. ... and probably what gets people hooked on QRPp ? For the first time since I discovered this mode of operation I found myself at home in the morning with a mind to switch on the radio and play. A Saturday morning with the whole weekend stretching away into the distance, and all this after a particularly hectic week at work. Unlike last Thursday when I forgot about the "20m Activity Day" until it was really too late, I remembered good old WSPR and fired the system up on 30m and left it going. On behalf of a group of several dedicated WSPRers (F6IRF, G4ILO, and G0KTN), I would like to propose that we make Wednesdays "Special Activity Days" to do some experimentation with coordinated WSPR activity beyond the usual operation on 30m. We would like to start this process by having this Wednesday, 22 October (0Z-24Z), be a 20m activity day. We will rotate to different bands each week, and we may come up with some other activities/experiments as well. We think we'll learn a lot about propagation and about our own stations by having a larger critical mass on alternate bands. In response to popular request I have made my compiled binary version of WSPR for Linux available. The program has been compiled on Xandros Linux similar to that used by Asus on the Eee PC. The user interface has been optimized so that it fits the 800 x 480 display of the original Eee PC, which I own. Some of the fonts have also been changed so that they are easier to read. After about one week of trying, it was last night when I finally saw my call in the spots list in the 40 mb. I started in the 30 mb but my homebrewed equipment failed to produce a clean signal in thet band, so I had to switch into 7 MHz. Not too many stations there and I spent some nights without any spots. What I finally did yesterday evening, was that I selected my tx frequency at the bottom of the band and it seemed to improve the situation. I had already triple checked just about everything, even the antennas being used. Read more about Finally heard !! !